Hello Aaron & Hello Eric! Based on pure logic and trajectory I refuse to believe the moon is the reason we had the total solar eclipse... I watch the moon, sun, sky, weather, etc., often throughout all times of the year. If the moon was the reason I would see it enter and pass the sun during the day, but we do not. Vedics as well as Indigenous groups in Colombia and others in Central and South America believe that Raju (2nd Sun that is invisible to our eye) is the reason for this. I've been charting my batteries being charged via solid state open loop circuits from potential difference and always note moon phases, sun, time of day, etc. The 2 weeks prior to the solar eclipse my batteries have been off the charts like I've never seen. Eric, does Raju play a larger role in powering our planet more than the visible sun? Anything you're comfortable with sharing would be immensely appreciated, THANKS!!! We're all here for you Eric and our energies are with you!!! If the moon was the reason I would see it enter and pass the sun during the day, but we do not. Ever seen a crescent moon in the daytime? Part of the moon is completely invisible to us. Sometimes, it is 100% invisible to us even though it is right there in the daytime sky because the sun is not illuminating it since the Earth is blocking the sun's light from hitting it. According to your logic, it should always be a full moon in the daytime. During an eclipse, the sun is hitting the far side of the moon meaning none of the moon facing us will be illuminated so obviously it will not be visible. Thank you for your reply and consideration to my question. During a normal Moon cycle, I do not believe the Earth is blocking a part of the Moon during the day when the Sun is in the sky and so is the Moon (crescent or otherwise). I have had troubles at times finding it when it's out during the day as a thin crescent but have still been able to find it. Just as I'm sure you have, I observe the sky day and night for years with charting of my batteries in relation to the Sun and Moon being top dead center and all other positions. What is being told to us doesn't make sense and I think Raju (another Sun) is a good possibility to explain this. My SINCERE APOLOGIES as I did not intend to ask an off-topic question as Eric studied the Sun for 6 years at Sonoma State so I thought this would apply. Sorry, for getting off track as that was not my intention. Thank you immensely Aaron for your time and all that you do for us all!!! Aaron: Love the photos. Whatever happened to the golden ratio antenna Eric developed for that? 30 minutes ago we both sat down and drew out all the dimensions based on an original one a local friend has. I'm putting it back into production as time permits. ricards, eliminate the physics notion of charge from your mind. steinmetz calls it a 'pre-historic notion' , see impulses waves and discharges book. 3 condensers in series, the dielectric induction distributes itself into the space between the plates or foils of the 3 condensers, that is why they are called condensers they condense dielectricity. if all 3 condensers are of equal capacity the dielectric induction divides itself into thirds, one third for each. however, inside the connecting conductors the induction contracts into its molecular dimensions. see jj thomson, electricity and matter. Last edited by t-rex; 08-31-2017 at 05:54 AM. ricards, eliminate the physics notion of charge from your mind. steinmetz calls it a 'pre-historic notion' , see impulses waves and discharges book. 3 condensers in series, the dielectric induction distributes itself into the space between the plates or foils of the 3 condensers, that is why they are called condensers they condense dielectricity. if all 3 condensers are of equal capacity the dielectric induction divides itself into thirds, one third for each. however, inside the connecting conductors the induction contracts into its molecular dimensions. see jj thompson, electricity and matter. Hello Eric, what was the spacing (10 feet apart?) of your 24 ground rods in the San Andreas, San Bernardino fault lines with your 500 feet of silicon bronze wire you talked about several years ago? Did you bury the bronze wire or was it on the surface? Gauge of wire used? What pattern did you use in laying out the ground rods? What would be the best layout and spacing to collect ground telluric electricity for say 24 to 60 qty of 8 foot long ground rods? Barbosa and Leal, Brazilian researchers are powering homes and factories with their ground "electron captor" devices down there. THere is also Tread on this forum talking about this. Last edited by vrand; 08-29-2017 at 08:40 PM. Is this a "Crystal Radio Initiative" style Tesla Magnifying Transmitter coil built into the military radio and connected to the fire hydrant? Thanks that makes much more sense, I will look at those books, got a copy of it. How do you see the Magnetism as the "Swirling of Aether", is it something like an underwater swirling vortex caused by an underwater current? The location of the grounding was at our "Camp David" facility at Bolinas, CA. Commonweal had it destroyed, just like Landers. The layout was a multiple star configuration, which radiated out from a common buss of 1 inch copper tubing. See the Bolinas "Barbara Boxer Report" for photos of Camp David. I have a hard time believing that Brazil thing. Show me photos of the Kilowatt meter turning? The receiver is a RT-66 out of a AN/GRC-9 setup. It is an excellent telluric radio since it has a "Tesla" front end. The coil is from the old Longitudinal Borderland video. Are you saying that you modified the radio to add a "Tesla" front end? Or, if I go on the surplus market and pick up a GRC-9 radio set, the radio will have the "tesla" front end built in? In the video I linked ( https://youtu.be/C0e84XyuTjo?t=4m36s ) there is no large external coil like you show in the Longitudinal Borderland videos, unless I missed something. There you show a large external coil out on the sand being used with the radio. It's a very cool demonstration. However the RT-66 radio in the original video ( https://youtu.be/C0e84XyuTjo?t=4m36s ) is not nearly big enough to hide that large coil inside the case. The RT-66 also appears to be connected directly to the fire hydrant. There is no large external coil anywhere near it, as far as I can see. How is it possible to receive directly out of the ground using the RT-66, without the large external coil? Sent an Email to Jeff at emedia.com about not receiving any download of Eric's 'Musical Seismograph' pdf after making payment but just received it back undelivered. This is now Day 12. Have not seen any other means by which I can communicate with anyone about this type of problem. Hope you are getting back on track OK and All the Best. The RT 66 has a highly resonant coil arrangement build into it so it can operate with only a ten foot whip antenna at lower frequencies of 2 to 12 mc/sec. I have no definite view of magnetism other than what J.J. Thomson gives. That is, the inertial reaction of the Aether to a variation of Faraday Tubes, or what are know as the Dielectric Lines of Force. See J. J. Thomson, "Recent Researches into Electricity & Magnetism." Fine business on your attempts in duplication. It seems no energy anomaly exists, but still the one in the Corolla persists in doing strange things. Moreover, the "Tesla Converter" also sometimes acts to reverberate the signals like it is making its own signal power by synthesis. Hence, I am not convinced yet that something of an energy anomaly exists but it remains an enigma. Thank you. Does Peter Lindemann still have the functioning Chris Carson rotary converter? A detailed study of that device, if it produces the claimed effects, would be useful. There is currently no publicly known testable theory for why such devices might produce any anomaly -- no hypthesized mechanism of action for which the experimenter can design and build an apparatus to test. In absence of a theoretical underpinning the experimenter is reduced to "firing bullets into the dark," building devices according to plans, with no real idea of why. And in absence of a working model the experimenter without a theory has no reality which can be tested in order to develop a theory. The Cris Carson unit is available and it is planned to recover it. Energy Synthesis idea is based on dimensional considerations. Induction per second is Resistance which can be positive,consumption, or it can be be negative,production.See my paper Law of Electro Magnetic Induction. I have given up on fooling with these things any more,too many dead horses here at Dead Horse Farms. Emails are working fine, not sure why it bounced back. If you can forward that bounce back to me in a separate email, I can see why. Aaron says for me to contact you as I have had no response to my payment on the 19th for the new EP Dollard Book 'Musical Seismograph'. The first attempt by Firefox led me to a Click Bank Page that was unresponsive. Second attempt by Google Chrome took me to a responsive site where I payed via PayPal but there was no 'green bar' to click on for the download as advised in the support notes. The Page I received was totally different to what your notes describe. Dear Eric, (If you're still there, hanging out at Aaron's place). Congratulations on your rebuke of the "flat earth" concept in the recent recorded video. I wish you all the best in overcoming your health related concerns or issues. - Your coyote like abilities will indeed help with this process. Last edited by Sputins; 09-01-2017 at 01:35 PM. David, please forward your paypal receipt to me. If you CC'd me the email to Jeff, I did not receive it. Please discuss this with me by email - not on the forum. We can't help you without the emails. I apologize for the inconvenience, but we can't provide customer service here. In the original Bolinas video you mention that the presence of the San Andreas fault makes for good conditions receiving through the ground. Would the RT-77 receiver be able to receive through the ground elsewhere in the world, or is that only possible with a fault line and the ocean nearby? Edit: And you were connecting the earth to the antenna terminal of the receiver, not the ground terminal? Last edited by Marcus Neuhof; 09-02-2017 at 05:27 PM. The receiver, R-66, receives out of the ground anywhere there is a good connection. Antenna terminal was connected to ground (Earth). We used the San Andreas Fault as a wave guide from KPH station in Bolinas to the facility at Landers. HF signals were guided along the fault to the PRC47 in the Corolla as it traveled along the path of the fault between locations. Every time the car crossed the fault, the signal strength was strong, even when the signals is non-existant via the ionosphere. Thank you for the info on Bolinas, California radio site. 2.5 TYPES OF EARTH ELECTRODE SUBSYSTEMS. with a consequent increase in impedance. A low impedance is desirable for minimizing lightning surge voltages. preferable to one long length of conductor. electrode makes effective contact between the propagating energy and the medium which dissipates the energy. 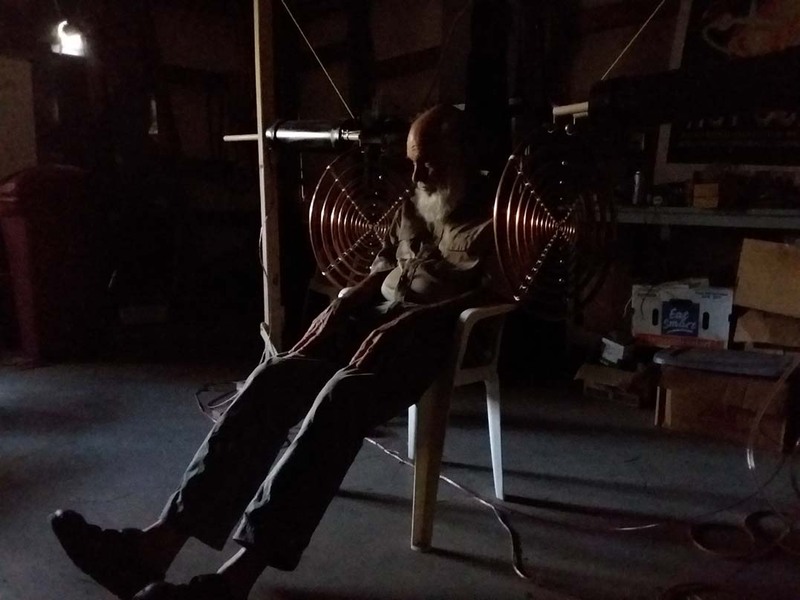 You talked about shortening the 40 & 80 meter antenna by winding it into a coil, so for 1 amp into the coil, 400-500 amps of current circulation into the ground. You talked about the need for an extremely low ground impedance of 0.1 to 0.01 ohm to accomplish this transmission. At the 38 min mark you talked about the 24 ground rods into the salt marsh at San Andreas, San Gregorio, and a third unnamed fault all converging. And 500 feet of silicon bronze wire all connected to a massive copper bus for transmitting from Los Angeles to San Francisco without an antenna. In the Mil 419 Handbook they designed to 10 ohm, and the NEC only requires a maximum of 25 ohm ground impedance. I was interested in your 24 ground rods and 500 feet of silicon wire design if you could elaborate on it. Did the ground rods form a circle, or radiated out from a central point? Did you then add horizontal radial silicon bronze radiating out from the ground rods? Was the wire buried? Wire gauge? Bus size? How you achieved 0.1 ohm ground impedance?